Today’s lunch was a festive meal prepared to celebrate the feast of the Nativity of Mary. 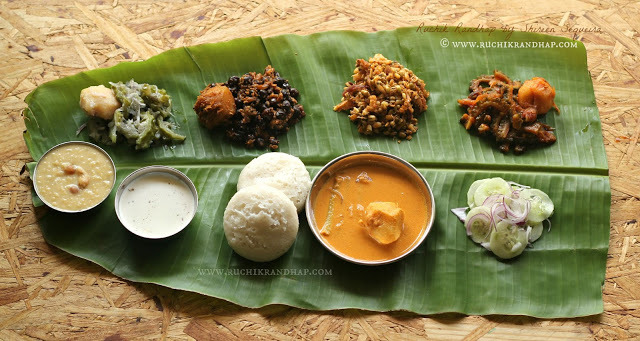 This also coincides with the harvest feast celebrated with great gusto among the Mangalorean Catholic community. This pure vegetarian fare is made up of odd numbered dishes consisting usually of gourds, legumes and other locally grown vegetables like lady’s finger, long beans, hog plums and cucumbers. Coconut is present in almost all the dishes. After having the new crop of paddy is blessed in the church it is distributed among the people who then take it home, pound a few grains of tender, new rice and mix it along with coconut milk sweetened and flavoured with jaggery and cardamom. It is then symbolically sipped by every member of the family, pretty much like a toast to good health but mostly to thank God for His benevolence, mercy and providence. I wish all my readers a happy feast and may you be blessed with everything you desire!